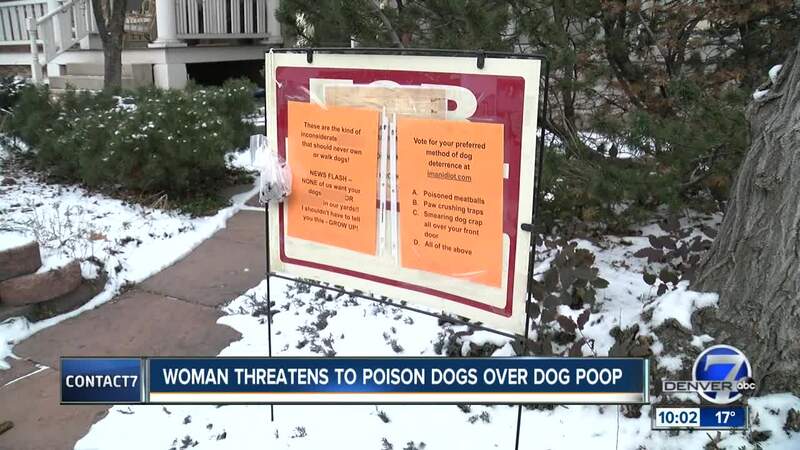 DENVER — Residents in Denver's Capitol Hill neighborhood say a homeowner's sign about cleaning up dog waste has gone too far. The sign, posted in front of a home on South Logan Street, reads: "These are the kind of inconsiderate a--holes that should never own or walk dogs!" The author of the sign also threatens to use poisoned meatballs and paw crushing traps if owners continue to fail to pick up after their dogs. "I'm frightened for the health of my dog," said Capitol Hill resident Jamie Zynger. "Somebody has now put in a large sign that she is going to poison animals that wander onto her property or set hunting traps to potentially kill them." Neighbors said they are worried about their animals or worse, that a child will get hurt. “I think that there has got to be a civil solution, some sort of happy medium where she can put up a small wire fence or maybe a more polite sign," said Zynger.